Ask a Russian where television, fashion shows, hip-hop or hieroglyphs were invented and you will no doubt hear вЂ” in Russia. Believing in the Russian genius is an essential feature of the Russian mentality. 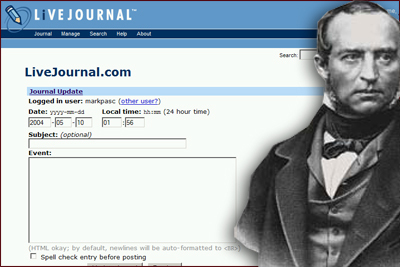 That is why no Russian was surprised when we found out with the help of Lenta.ru the Internet in general, and blogging in particular, was, if not invented, at least predicted by a Russian back in 1837. Prince Vladimir Odoevsky, 1803-1869, was a gifted man. Apart from writing philosophical books, stories for children and composing pieces of music, he also wrote science fiction, trying to imagine what his country would look like in 2,500 years, in 4338. The fact that among other utopian inventions Odoevsky described something very close to the Internet and blogging was brought to public attention by вЂ” surprise, surprise вЂ” a blogger. Ivan Dezhurny, a Russian music producer, is generally fond of futuristic literature. Reading OdoevskyвЂ™s novel вЂњYear 4338вЂќ, written in 1837, Dezhurny republished selected bits of the book on his personal blog to the delight of his readers. Odoevsky suggested in future there would be a kind of connection between houses that would allow people to communicate quickly and easily, the way they do now via the Internet. вЂњHouses are connected by means of magnetic telegraphs that allow people who live far from each other to communicate,вЂќ Odoevsky wrote. Even more interestingly, Odoevsky suggested every household would publish a kind of daily journal or newsletter and distribute it among selected acquaintances, a habit which Russian bloggers immediately recognized as blogging. вЂњWe received a household journal from the local prime minister, which among other things invited us to his place for a reception,вЂќ one of OdoevskyвЂ™s characters tells a friend. However, Odoevsky, a prince and a wealthy man, could not imagine people taking so much bother to keep their acquaintances updated on their daily affairs. He suggested the job would be carried out by the butler. OdoevskyвЂ™s book contains other curious predictions, such as the threat of the Earth colliding with a comet and Russians planning to fire rockets at it to prevent the collision. Literature theorists say the unusual remoteness of OdoevskyвЂ™s predictions вЂ” 2,500 years вЂ” could be explained by the slow pace of life that Russian society led in the 19th century. The European Union argued on Tuesday over how strongly to criticize RussiaвЂ™s treatment of neighboring Georgia, three days before a sensitive summit with President Vladimir Putin in Finland. On Monday, Oct. 16, Russia demanded that the United States lift sanctions against two Russian companies accused of making deals with Iran involving sensitive technology. RussiaвЂ™s UN Ambassador Vitaly Churkin hinted that a U.S. refusal could affect negotiations on UN sanctions resolution against Tehran. Vladimir Putin met foreign academics and journalists at his countryside residence at Novo Ogarevo on Sept. 9 to discuss RussiaвЂ™s domestic and foreign policy, ties with China, Iran and the U.S., energy and economic issues. For the sake of fairness, it is right, it is responsible, that even in the West people should know the suffering and repression for which Gorbachev was still responsible within the USSR. In spite of his veneer of softness, inside he was still the direct heir to all the previous Soviet rulers, and, in fact, pretty unyielding. MoscowвЂ™s most famous Arbat street was Sunday flooded with hundreds of happy young people embracing each other and the amazed passers-by as the the hippy-style вЂњHug Me!вЂќ flashmob took place. Participants of the flashmob were told to arrive at the beginning of the street at a certain time carrying a sheet of paper saying вЂњHug Me!вЂќ The aim of the action was to brighten up rainy Russian autumn, organizers said.